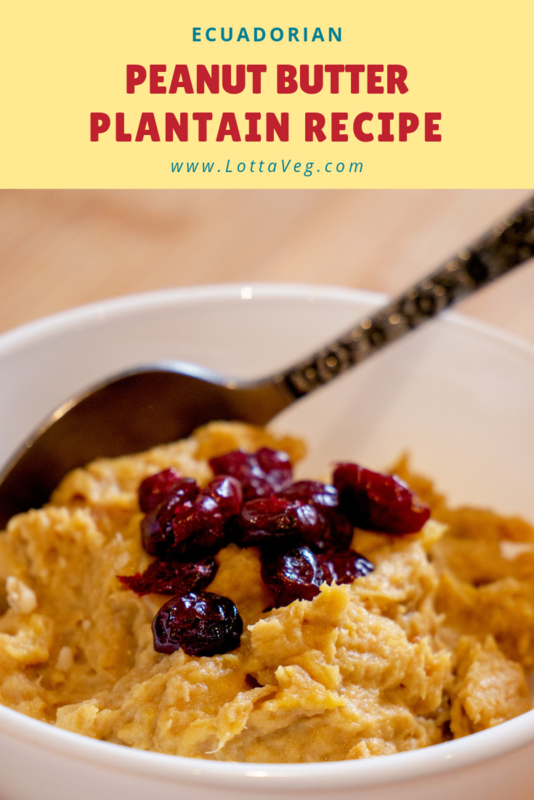 This Ecuadorian Peanut Butter Plantain Recipe was introduced to us by our Russian friend, Olesya, who lives with an Ecuadorian family here in Cuenca, Ecuador. She said her host family makes this recipe all the time, and we know why. IT’S DELICIOUS!!! You can make this plantain recipe with green (verde) or ripe (maduro) plantains (platanos). We’ve tried both and prefer ripe plantains. They’re sweeter and more dessert like. The green plantains require more sweetener. When Olesya made us this plantain recipe the first time, she served it in a small bowl and we ate it with a spoon. Since then, Amelia has done some experimenting with the recipe. We’ve found that we like forming them into balls and baking them in the oven for a bite sized finger snack/treat. It’s also good with some cocoa powder or chocolate chips mixed in, or topped with some dried fruit. The options are endless! If you like plantains, you may also enjoy our Oil-Free Grilled Plantains Recipe. 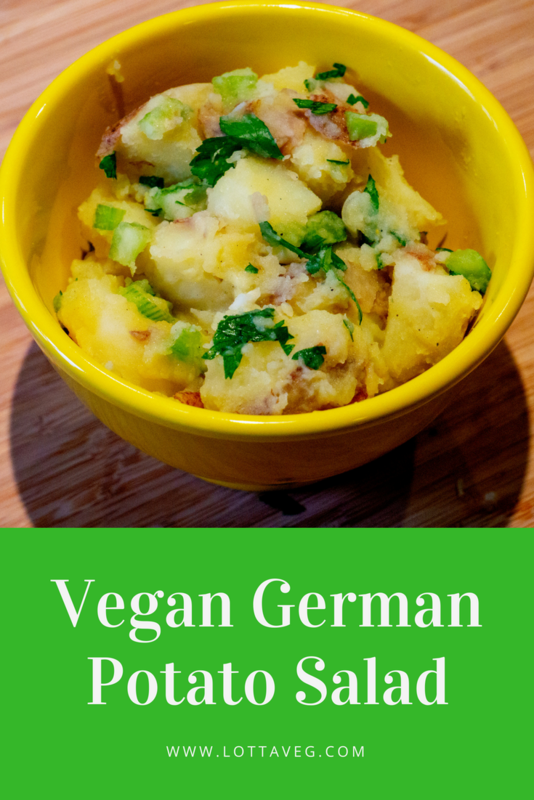 This Vegan German Potato Salad recipe tastes a lot like the potato salad my German grandmother made when I was a kid. It’s very vinegary and flavorful. Traditional German Potato Salad is made with bacon so we simply omitted that and didn’t notice its absence. However, you may be able to simulate that flavor by adding some liquid smoke into the dressing. Bacon gets most of its flavor from the liquid smoke it’s bathed in, so adding a little of it to this recipe might do the trick. Or you could use some bacon bits, which are vegan because they aren’t made of bacon. They’re not healthy, either, but they do taste like bacon. If you try either of these options, please let us know what you think. Amelia liked the crunch of the raw celery and green onion, but I would prefer it slightly sautéed so there’s not as much difference in texture between the raw veggies and the cooked soft potatoes. It’s a weird texture thing for me to bite into a soft potato and then hit a crunchy piece of celery. If you’re like me, you might want to sauté the celery and onion in a little veggie broth to soften them up. This recipe pairs well with any vegan burger, corn-on-the-cob, green beans or your favorite vegan dishes. 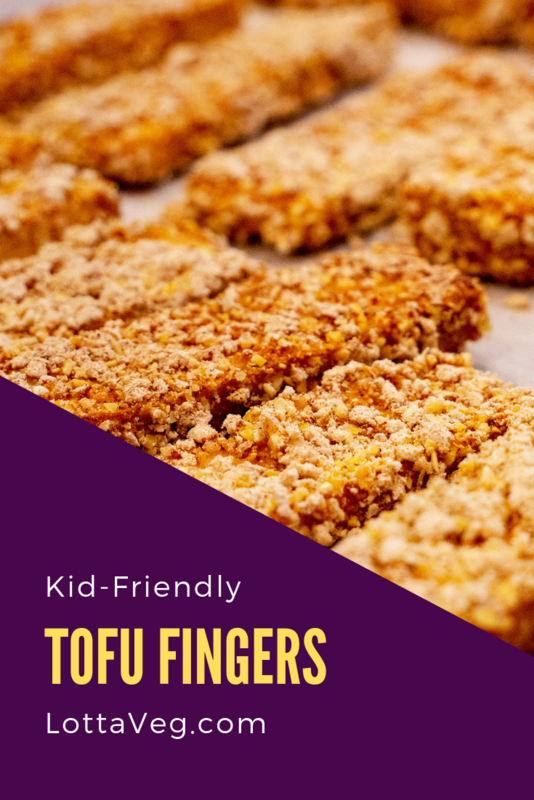 While we were visiting Amelia’s family in Atlanta, Amelia’s 9 year old niece challenged us to make more kid-friendly vegan recipes and this Tofu Fingers recipe one of them. She really liked them, as did the whole family. She’s a VERY picky eater, so anything other than “I hate it” means she loved it. She dipped hers in ketchup, but her grandpa and I preferred BBQ sauce. If you’re concerned about feeding organic soy to your children, rest assured it’s not only safe, but highly nutritious. Most of the myths about soy were created by the dairy industry when soy milk started eating away at their profits. The unbiased, legitimate science shows soy is actually protective against the very ailments that, ironically, dairy has been shown to cause. One of the main concerns about soy is the phytoestrogen content that the myths claim can interfere with human hormones. Phytoestrogens are a type of plant estrogen that behaves much differently in the human body compared to mammal estrogen found in cow’s milk, which looks just like human estrogen inside our bodies. In fact, one study found that soy was protective against early puberty in girls, whereas consumption of meat was strongly associated with early puberty in both girls and boys. We strongly encourage you to buy only organic soy products, though. The unbiased science is far from settled on the health effects of GMO, but putting that aside, there are plenty of non-health reasons to avoid GMO products. GMO’s encourage monocrops, which are destroying the soil. They are leading to superbugs and superweeds that are resistant to even the strongest pesticides. They lead to more fertilizer and pesticide use, which contaminates water supplies. And they give corporations too much control of our food system. Please consider watching GMO OMG for an overview of the GMO industry. 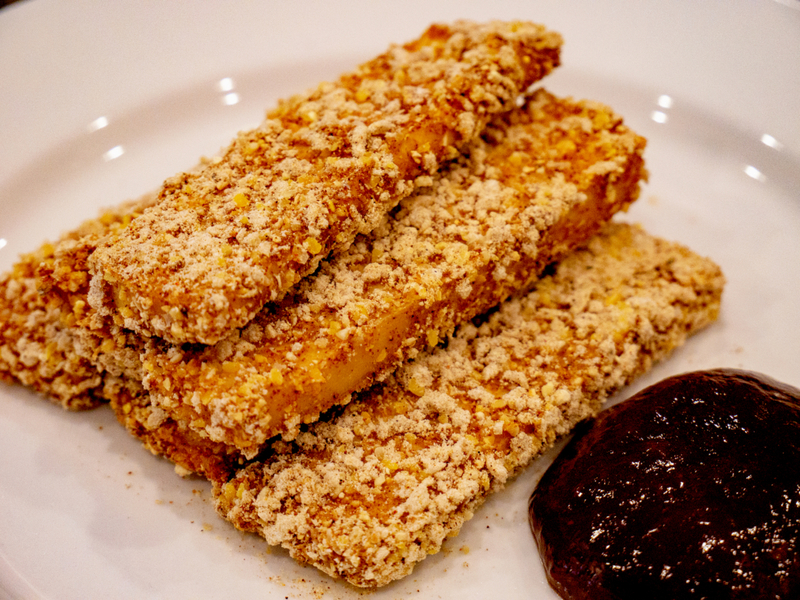 Back to the recipe at hand… These Tofu Fingers are very tasty dipped in your favorite dipping sauce like ketchup, BBQ sauce, Vegan Ranch Dressing, salsa, Grandpa’s Vegan Dipping Hot Sauce, etc. They make a great afternoon snack or appetizer, or as a side dish with soup and salad. This Vegan Chickpea Chocolate Cookies recipe is so delicious! The cookies are moist and oh so chocolatey. They’re perfect for non-vegan potlucks. 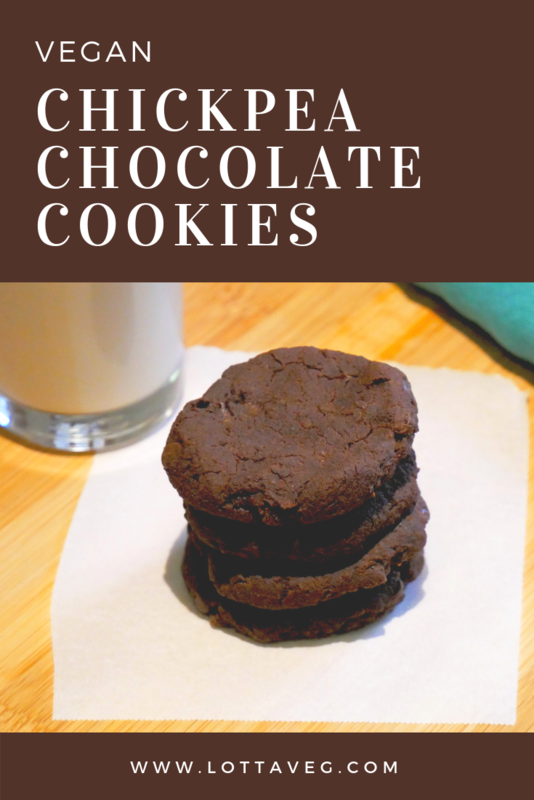 They’re also great if you’re suffering from an intense chocolate craving because you can have them ready to eat fresh from the oven in about 20 minutes. There’s no flour in this recipe. The chickpeas do all the heavy lifting. That means it’s gluten-free as long as all the other ingredients don’t have gluten. The chickpeas also make these cookies a protein powerhouse with 4 grams per cookie. The peanut butter combines with the cocoa powder to make a really rich chocolate peanut buttery taste. The vegan chocolate chips are optional since the cookies are already very chocolatey. By omitting them, you’ll cut the saturated fat in half and the calories by a third. Each cookie is 82 calories without the chocolate chips. If you like moist chocolate desserts, you’ll also LOVE our Vegan Beet Brownies. 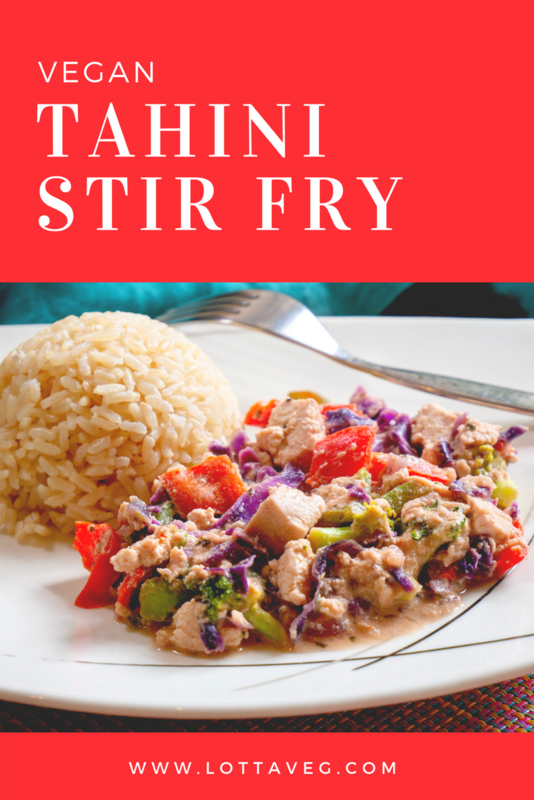 This Tahini Stir Fry with Tofu recipe is one of our favorites stir fries. 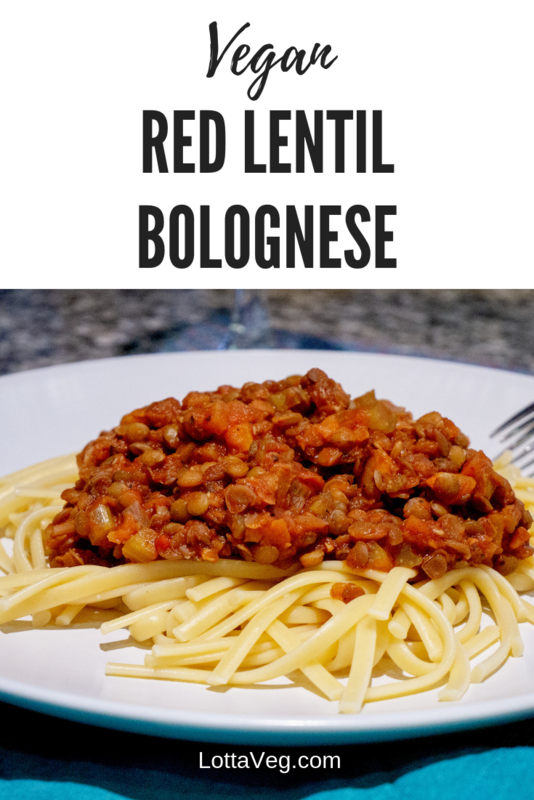 We used to eat this one almost every week because it’s fast, easy and flavorful. However, since I found out I still have high cholesterol, we’ve cut this one out for awhile. We still eat stir fries similar to this one every week, but the tofu and tahini add 5 grams of saturated fat per serving, which is way more than I need to consume while trying to lower my cholesterol. It’s also not great for weight loss so if you’re trying to lose weight or lower your cholesterol, you’re better off eating our low-fat Easy Vegan Asian Stir Fry. Greger might disagree with this advice, but I side with Esselstyn and Ornish on this one. They’re the experts in heart disease, which runs rampant in my family, along with cancer, stroke, diabetes and obesity. With the deck stacked against me, Amelia and I have decided to err on the side of caution when it comes to foods high in saturated fat, like tahini. With that said, the tofu in this recipe adds a nice meaty texture and contributes most of the 18 grams of protein. And it absorbs the flavors of the sauce and other ingredients so it’s very tasty. This recipe is also loaded with fiber, vitamin C, calcium and iron. This is a nice one-pot meal (not counting the rice) so it’s also fast and easy to clean up. 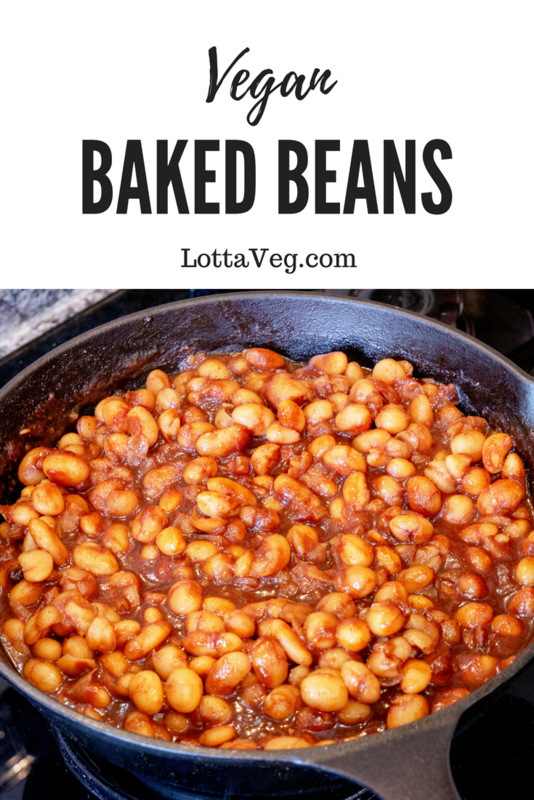 This Vegan Baked Beans recipe (or BBQ Baked Beans) is absolutely delicious! It’s sweet, savory and spicy, but it also has a LOT of sugar, so do your best not to eat all of it in one sitting! For a 1/2 cup serving, there are 207 calories with 92 coming from sugar. It has 23 grams of sugar (still far less than a can of soda), which is more than half of the recommended daily value. That means this is NOT a health food recipe. It’s meant to be a treat on a special occasion (like Labor Day) or a family event when you want to show people how good vegan food can taste. If you’re currently a diabetic, you should definitely not eat these beans! While this recipe does have a lot of sugar, it also has some healthy ingredients. The beans are loaded with protein and fiber, as well as calcium and iron. They’re also really low fat, with less than half a gram per serving. Our bodies are very efficient at burning carbs (including sugar) for energy, and they’re very efficient at storing fat for future use during times of famine (that most of us never have to experience). So if you’re in good shape, at your ideal body weight, and without diabetes, you can enjoy these Vegan Baked Beans knowing your body will know how to handle the carbs (it’ll probably make you feel like going for a long walk after dinner). Most BBQ Baked Beans are made with lard and/or bacon, which obviously isn’t vegan or healthy (unless you live in upside-down world). However, you can achieve a similar taste by using liquid smoke. After all, that’s what gives bacon it’s flavor. Without liquid smoke and sometimes maple syrup or molasses, bacon would taste like bland, fatty meat…pretty much how all meat tastes without plants added for seasoning. But if the liquid smoke is too reminiscent of bacon for you, just skip it. If you’re in the US, most liquid smoke and molasses aren’t vegan. That’s because they contain non-organic sugar, which is processed using the ground up bones of dead animals to give it a pretty white color. Sugar in most parts of the world has a tan hue, which tastes the same, it’s just not as superficially pretty. Look for “pure liquid smoke” without molasses. And look for vegan or organic molasses, or molasses made with organic sugar. These Vegan Baked Beans pair well with any vegan burger, potato salad, corn-on-the-cob, green beans, or any of your favorite vegan recipes. This Oil Free Grilled Plantains recipe is exceptionally delicious! Unlike most fried plantains, these are much lower fat due to a little trick Amelia thought up. We bought some plantains and I was standing there staring at them while Amelia was making some hummus. I was complaining to her that without oil, it’s hard to get the browned look that we take for granted when cooking with oil, especially with traditionally fried items like plantains. She had reserved the aquafaba from the chickpeas (aquafaba is chickpea juice) and suggested I use that as a browning agent. It was a eureka moment! So I took 1/4 cup of the aquafaba and put it in a bowl. Then I added some brown sugar, fresh squeezed orange juice, a little water and a little cilantro to the bowl and stirred it up. Then I added the sliced plantains to the bowl and stirred to coat them. When I put it on our electric griddle, it browned just like it had oil on it. It was even crispier than I expected. Plantains have a lot of calories: over 200 for one plantain. That’s twice the calories of a large banana. So with the added sugar, this isn’t a very low calorie treat, but it is pretty healthy otherwise. If you’re a sugar-phobe, you can try it without the brown sugar or replace it with another type of sweetener. However, the brown sugar did caramelize on the griddle, helping to brown the plantains and seal in the flavors. Remember, brown sugar in the States is only vegan if it says it on the package, or if it’s organic. Otherwise, it could have a variety of animal derived products in it. 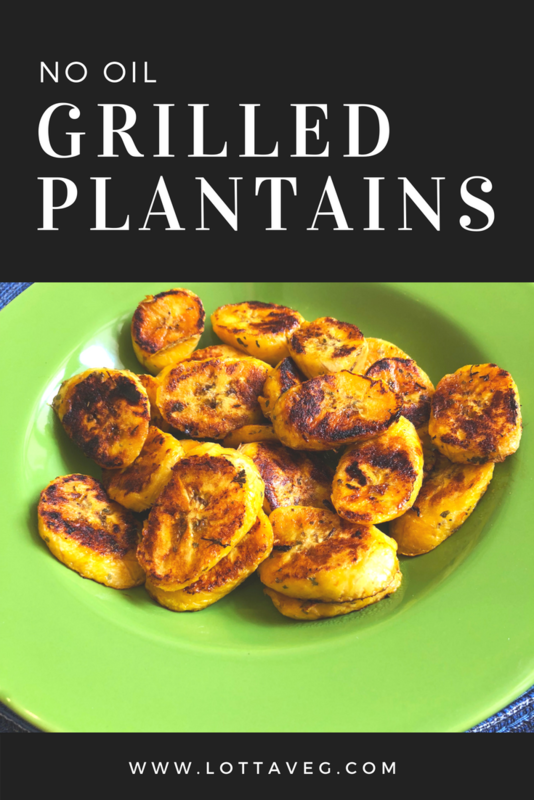 This Oil Free Grilled Plantains recipe works well as a snack (it’s very filling) or as a dessert with some vegan ice cream. You can also use it as a sweet and savory side dish. Yum!!! 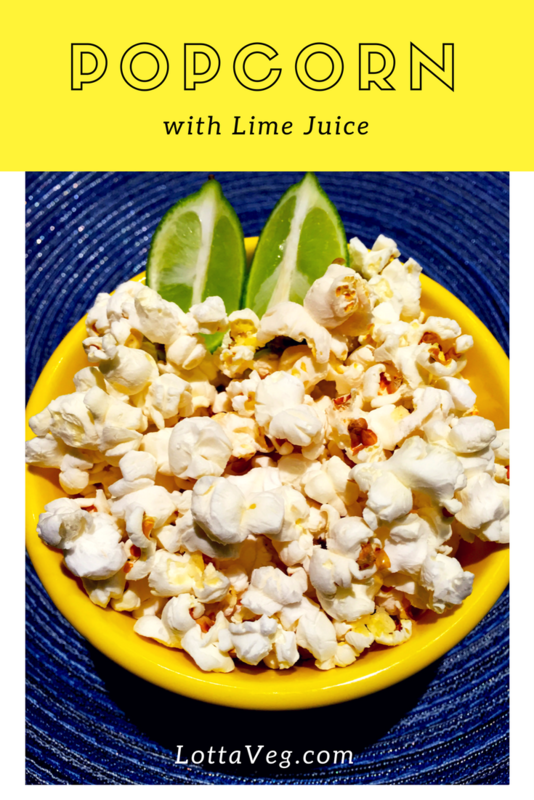 This Popcorn with Lime Juice recipe is a great low calorie snack. The lime juice gives the popcorn a delicious flavor with minimal calories and some extra Vitamin C.
For oil-free popcorn, use an air popper (without the butter, obviously). Or, you can make it in a pan on the stove using 1 tbsp of vegetable oil. That adds some additional calories and oil certainly isn’t a whole food, but we haven’t figured out how to make oil-free popcorn on the stove yet. If you know how, please let us know! We learned about the lime juice trick on a trip to Ecuador. Some restaurants serve popcorn with lime wedges as a table snack. I don’t know why we never thought of squeezing fresh lime juice over popcorn since we love corn chips with lime, but it never occurred to us. The lime juice gives the popcorn a tangy, almost buttery, flavor. It also gives something for your salt to stick to, if you like salt on your popcorn. We recommend using organic popcorn. Popcorn with Lime Juice not only tastes better than the conventional topping, but it’s also much lower calorie and healthier. Enjoy! 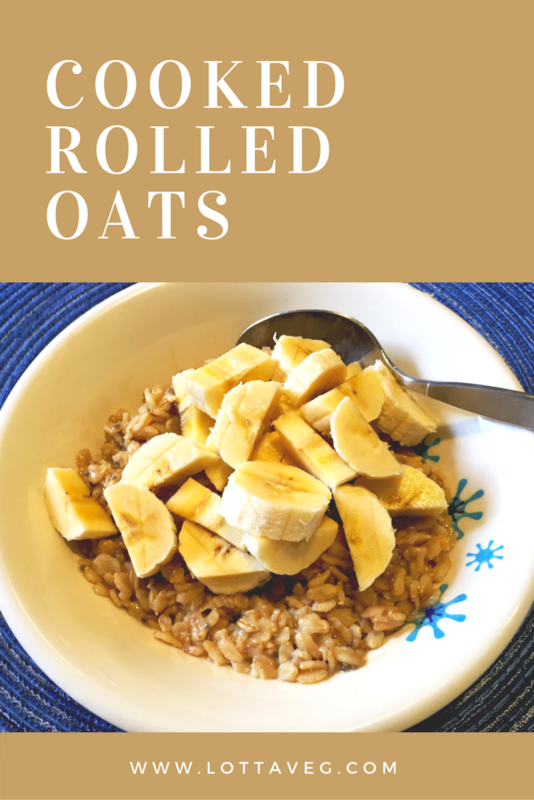 This Cooked Rolled Oats recipe is a traditional favorite and a hearty breakfast that’s sure to keep you satisfied until lunch. Enjoy topped with your favorite fruit and/or berries. We like our oats and eat them a lot. We especially like them raw in our Rolled Oats Breakfast, but on a cold winter morning, these Cooked Rolled Oats are hot and satisfying. Whole grains like oats have gotten a bad reputation from the low carb communities, which may be contributing to the leading cause of death among those who eat very little them: heart disease. Whole grains, especially oats, have been shown in numerous clinical trials to reduce heart disease, prevent strokes and help with weight control. In fact, eating 3 servings of whole grains per day may be just as effective at treating hypertension as taking prescribed medications. If you’re still a believer in the low carb fad diets, it may be time to revisit your preconceptions to minimize your risk of preventable disease.